Hodge adds material handling equipment line to support customers who operate in rough terrain environments. Dubuque, IA - As a part of the Hodge’s commitment to offering equipment solutions to help customers succeed across diverse industries and environments, Hodge is pleased to announce that they have been appointed as an authorized dealer of Sellick Equipment within select counties in Iowa, Illinois and Wisconsin. 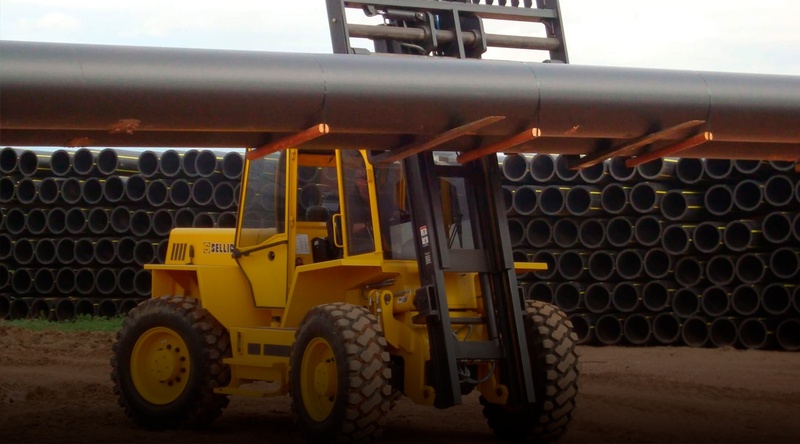 As a leader in rough terrain equipment, Sellick offers forklifts and material handling equipment designed to lift and tow heavy or extremely large loads efficiently in rough terrain environments. “Sellick is an expert in rough terrain equipment," states Todd Kintop, VP of Material Handling at Hodge. ”We're excited for the opportunity to be able to better assist our customers who operate in these types of environment." Originally started in 1969, Walter Sellick along with sons Howard and David converted a Ford 4500 industrial tractor into a 6,000 lb forklift for outdoor use. From simple tractor conversions in the early 1970’s, growth for Sellick Equipment escalated with the development of the integral one-piece frame. The design could accommodate various industrial power trains which lead to brand manufacturing for John Deere and International Harvester. In recent years a new generation of forklifts was introduced featuring enhanced ergonomics, environment friendly diesel engines, increased lift capacities, and a broad range of models. Currently, there are over 11,000 Sellick built machines in the field which are serviced by an extensive North American dealer network consisting of 230 locations.